Aim: To evaluate the effect of application a new-generation bulk-fill flowable composite resin as an intermediate material between composite resin and dental substrates on micro-leakage in Class V composite restorations. Materials and Methods: A total of 144 Class V cavities were prepared in 72 human molars. Specimens were then randomly distributed among three groups according to adhesive system applied (Group 1: Clearfil SE Bond; Group 2: Adper Easy One; Group 3: Adhesive 200T), and each group was divided into three subgroups according to liner material used (Group A: No liner-control group; Group B: Aelite Flo LV, low viscosity microhybrid composite; Group C: Smart dentin replacement). All cavities were restored using resin composite (Aelite LS, low shrinkage posterior composite). Specimens were stained with 0.5% basic fuchsin and evaluated dye penetration. Results: There was no significant difference in dye penetration was found between the control and the experimental groups. Conclusions: Micro-leakage is not affected by the application of either conventional or new-generation flowable composite resin as an intermediate material between composite resin and dental substrates. The use of a liner to act as a flexible intermediate layer between restoration and substrate has been suggested as a method of relieving the stress associated with polymerization shrinkage. Flowable composites have been recommended as liners due to their low viscosity, increased elasticity, and wettability. Estafan et al. confirmed the efficiency of this technique in improving the marginal adaptation of composite restorations. Micro-leakage is a phenomenon in which oral micro-organisms, fluids, and chemical substances are diffused through the interface between tooth structure and restorative material. Fluids may progress through the dentin into the pulp, resulting in post-operative sensitivity, recurrent caries, pulpal inflammation, and restoration failure. The rapid development of dental materials, and the time needed for in vivo and in vitro studies has meant that the effects of SDR as an intermediate layer under resin composites on marginal micro-leakage have not received sufficient attention. Therefore, this study aimed to investigate the effect of a new-generation flowable composite resin, SDR on micro-leakage in Class V composite restorations. The null hypothesis of the study was that micro-leakage would not be affected by types of flowable composite. Group 1: Two-step, self-etch adhesive system (Clearfil SE Bond, Kuraray, Osaka, Japan). Group 2: One-step, self-etch adhesive system (Adper Easy One, 3M ESPE, Seefeld, Germany). Group 3: Total-etch adhesive system (Adhesive 200T, 3M ESPE, MN, USA). Application techniques and manufacturers' details are provided in [Table 1]. Group A: No liner (control group). Group B: Conventional flowable composite resin (Aelite Flo LV, Bisco, IL, USA). 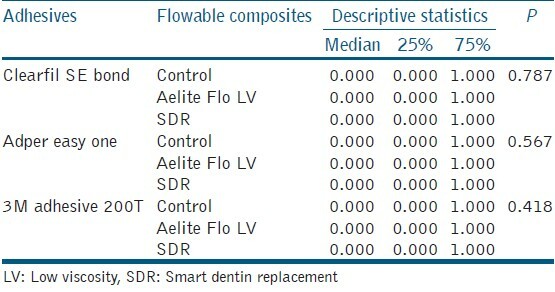 Group C: New-generation flowable composite resin (SDR, Dentsply, Konstanz, Germany). In both Groups B and C, 1 mm of composite was applied to the cavity surfaces as a liner prior to the composite restoration. All specimens were restored with the light-activated, hybrid composite resin Aelite LS Posterior (Bisco, IL, USA) using an incremental technique, with one increment applied obliquely against the occlusal wall, another against the gingival wall, and a final increment applied following the tooth contour. Each increment was light-cured for 20 s with a visible light-curing unit (Elipar Free Light III, 3M ESPE, St. Paul, MN, USA). Specimens were stored in distilled water for 24 h at 37°C. Restorations were polished with a series of finishing disks (Bisco Inc., IL, USA) of decreasing abrasiveness. All cavity preparations, restorations, and finishing procedures were performed by the same operator. After 24 h storage in distilled water at 37°C, the restored teeth were subjected to thermocycling for 1000 cycles in water baths at 5 and 55°C with a dwell time of 30 s. Nail polish was applied to the teeth, except on the restorative material and tooth structure 1 mm from the cavosurface margins. All specimens were immersed in 0.5% basic fuchsin solution for 24 h and then were sectioned longitudinally through the center of the restorations with a low-speed diamond saw under water spray. Statistical analysis was performed using Mann-Whitney U and Kruskal-Wallis tests at P < 0.05. Multiple comparisons were made using the Tukey test. Mean micro-leakage scores of all groups are given in [Table 2] and [Table 3]. Both SDR and conventional flowable composite resin did not affect micro-leakage as an intermediate layer. No statistically significant differences were observed between groups ( P > 0.05) [Table 4]. The use of a liner as a flexible intermediate layer has been mentioned among numerous methods suggested for relieving the stress caused by polymerization shrinkage. , This is based on the lower Young's Modulus of elasticity exhibited by flowable composite in comparison to other hybrid materials, , which could help dissipate the contraction stress that occurs during polymerization. In addition, to their increased elasticity, the low-viscosity and high wettability of flowable composites have led to their recommendation as suitable liners. Although some studies have shown flowable composite used as a liner to exhibit superior contact with the floors, and walls of cavity preparations, , in vitro studies have yielded conflicting results regarding the ability of an elastic liner to decrease micro-leakage. Yazici et al. found a combination of flowable and hybrid composites to yield the most effective reduction in micro-leakage. Simi and Suprabha  showed that the marginal adaptation of a composite improved when used in conjunction with a flowable composite lining. Furthermore, Chuang et al. concluded that a 0.5-1.0 mm layer of flowable composite liner used under packable composite restorations resulted in a significant reduction in micro-leakage. It is possible that the relatively thin layer of the liner minimized the effects of the polymerization shrinkage in the present study. In contrast, some studies have indicated that the use of flowable material as an intermediate layer does not reduce micro-leakage in posterior composite restorations. ,,, Majety and Pujar  reported that the thickness of the flowable composite intermediate layer does not affect micro-leakage. Swift et al. showed that the use of a low-viscosity resin as an intermediate layer does not have a consistent effect on micro-leakage of Class V composite restorations. Similarly, this study found that the use of a flowable composite liner does not affect micro-leakage. A recent study, comparing SDR with two traditional flowable methacrylate-based composites found that SDR had the lowest level of shrinkage stress, the longest pre-gel time, and the lowest shrinkage rate. Koltisko et al. found the polymerization stress of SDR to be lower than that of other flowable composites, whereas no differences were found in flexural modulus and volumetric shrinkage (3.5% volume) of the composites tested. According to, Burgess et al.,  the chemistry of SDR is designed to slow the polymerization rate, thereby reducing polymerization shrinkage stress without affecting polymerization shrinkage levels. Jin et al. found that the new SDR resin system in unfilled, as well as in various differently filled formulations, exhibited less curing stress than conventional resin. Although SDR had the lowest shrinkage stress, in the present study, no differences were observed in micro-leakage between teeth restorated in SDR and in the conventional flowable composite resin. 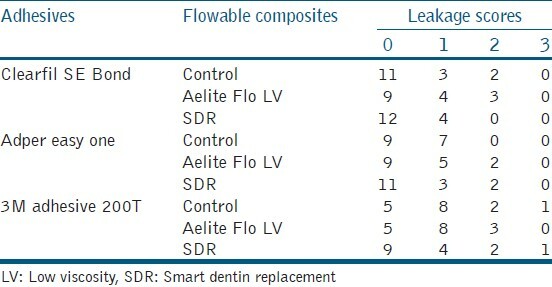 The combinations of packable composite with SDR and with conventional flowable composite resin tested in the present in vitro study in order to, demonstrate micro-leakage in Class V composite restorations. It can be concluded that the use of new-generation and conventional flowable composite resins as an intermediate layer between restoration and dental substrate does not reduce micro-leakage. 1. Alonso RC, Sinhoreti MA, Correr Sobrinho L, Consani S, Goes MF. Effect of resin liners on the microleakage of class V dental composite restorations. J Appl Oral Sci 2004;12:56-61. 2. Bayýndýr YZ, Bayýndýr F, Zorba YO, Turgut H. Influence of different bonding systems and soft-start polymerization marginal gap formation. Mater Res Innovat 2008;12:166-71. 3. Simi B, Suprabha B. Evaluation of microleakage in posterior nanocomposite restorations with adhesive liners. J Conserv Dent 2011;14:178-81. 4. Radhika M, Sajjan GS, Kumaraswamy BN, Mittal N. Effect of different placement techniques on marginal microleakage of deep class-II cavities restored with two composite resin formulations. J Conserv Dent 2010;13:9-15. 5. Estafan D, Estafan A, Leinfelder KF. Cavity wall adaptation of resin-based composites lined with flowable composites. Am J Dent 2000;13:192-4. 6. Bayne SC, Thompson JY, Swift EJ Jr, Stamatiades P, Wilkerson M. A characterization of first-generation flowable composites. J Am Dent Assoc 1998;129:567-77. 7. Ilie N, Hickel R. Investigations on a methacrylate-based flowable composite based on the SDR™ technology. Dent Mater 2011;27:348-55. 8. Jin X, Bertrand S, Hammesfahr PD. New radically polymerizable resins with remarkably low curing stress. J Dent Res 2009;88:1651. 9. Roggendorf MJ, Krämer N, Appelt A, Naumann M, Frankenberger R. Marginal quality of flowable 4-mm base vs conventionally layered resin composite. J Dent 2011;39:643-7. 10. Alani AH, Toh CG. Detection of microleakage around dental restorations: A review. Oper Dent 1997;22:173-85. 11. Umer F, Naz F, Khan FR. An in vitro evaluation of microleakage in class V preparations restored with Hybrid versus Silorane composites. J Conserv Dent 2011;14:103-7. 12. Sadeghi M. Influence of flowable materials on microleakage of nanofilled and hybrid Class II composite restorations with LED and QTH LCUs. Indian J Dent Res 2009;20:159-63. 13. Hegde MN, Vyapaka P, Shetty S. A comparative evaluation of microleakage of three different newer direct composite resins using a self etching primer in class V cavities: An in vitro study. J Conserv Dent 2009;12:160-3. 14. Bausch JR, de Lange K, Davidson CL, Peters A, de Gee AJ. 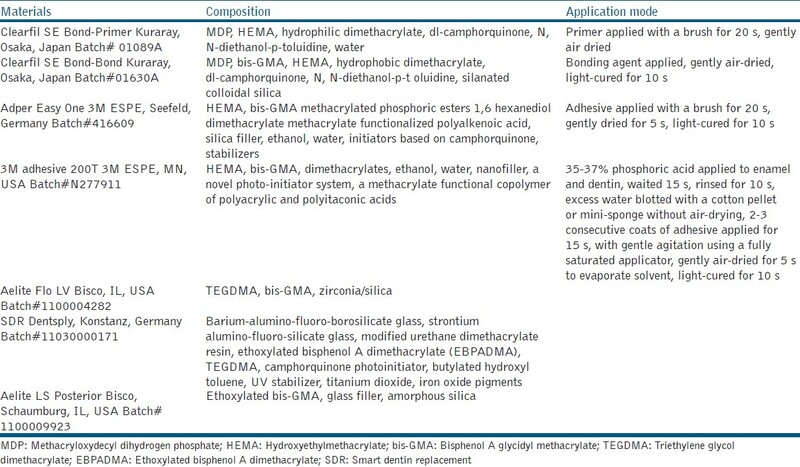 Clinical significance of polymerization shrinkage of composite resins. J Prosthet Dent 1982;48:59-67. 15. Alvarez-Gayosso C, Barceló-Santana F, Guerrero-Ibarra J, Sáez-Espínola G, Canseco-Martínez MA. Calculation of contraction rates due to shrinkage in light-cured composites. Dent Mater 2004;20:228-35. 16. Usha H, Kumari A, Mehta D, Kaiwar A, Jain N. Comparing microleakage and layering methods of silorane-based resin composite in class V cavities using confocal microscopy: An in vitro study. J Conserv Dent 2011;14:164-8. 17. Kemp-Scholte CM, Davidson CL. Complete marginal seal of Class V resin composite restorations effected by increased flexibility. J Dent Res 1990;69:1240-3. 18. Leevailoj C, Cochran MA, Matis BA, Moore BK, Platt JA. Microleakage of posterior packable resin composites with and without flowable liners. Oper Dent 2001;26:302-7. 19. Attar N, Tam LE, McComb D. Flow, strength, stiffness and radiopacity of flowable resin composites. J Can Dent Assoc 2003;69:516-21. 20. Yazici AR, Baseren M, Dayangaç B. The effect of flowable resin composite on microleakage in class V cavities. Oper Dent 2003;28:42-6. 21. Chuang SF, Jin YT, Liu JK, Chang CH, Shieh DB. 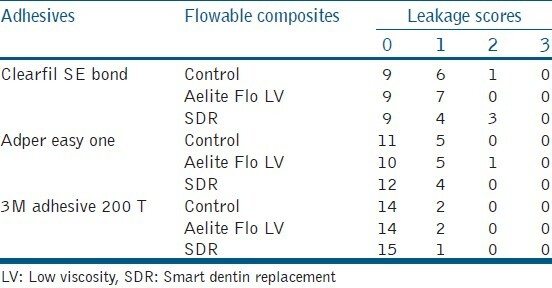 Influence of flowable composite lining thickness on Class II composite restorations. Oper Dent 2004;29:301-8. 22. Neme AM, Maxson BB, Pink FE, Aksu MN. Microleakage of Class II packable resin composites lined with flowables: An in vitro study. Oper Dent 2002;27:600-5. 23. Ziskind D, Adell I, Teperovich E, Peretz B. The effect of an intermediate layer of flowable composite resin on microleakage in packable composite restorations. Int J Paediatr Dent 2005;15:349-54. 24. Tredwin CJ, Stokes A, Moles DR. Influence of flowable liner and margin location on microleakage of conventional and packable class II resin composites. Oper Dent 2005;30:32-8. 25. Tollidos K, Setcos JC. Initial degree of polymerization shrinkage exhibited by flowable composite resins. J Dent Res 1999;78:483-5. 26. Majety KK, Pujar M. In vitro evaluation of microleakage of class II packable composite resin restorations using flowable composite and resin modified glass ionomers as intermediate layers. J Conserv Dent 2011;14:414-7. 27. Swift EJ Jr, Triolo PT Jr, Barkmeier WW, Bird JL, Bounds SJ. Effect of low-viscosity resins on the performance of dental adhesives. Am J Dent 1996;9:100-4. 28. Giovannetti A, Goracci C, Vichi A, Chieffý N, Polimeni A, Ferrari M. Post retentive ability of a new resin composite with low stress behaviour. J Dent 2012;40:322-8. 29. Burgess J, Cakir D. Comparative properties of low-shrinkage composite resins. Compend Contin Educ Dent 2010;31:10-5. 30. Koltisko B, Dai Q, Jin X, Bertrand S. The polymerization stress of flowable composites. J Dent Res 2010;89:321.